Eating season officially ended at 12:01 am, January 1st, 2015. With an average two extra pounds packed on during the celebrations, Americans now begin their fight against holiday hangover and a return to five day work weeks, as they attempt to reverse the trend and trim the well-earned tonnage. Having an event to work towards is a great way to keep you on track. Here are 8 athletic endeavors in the Charlotte area to keep you motivated throughout the beginning of this new year. Part of the Resolution Race Series, five races held between January and April, the Village 5/10K is a pleasant trot through the residential streets of Waxhaw, NC. Cast Iron Waffles will bestow fresh made goodies to participants post-race. Event supports Alpha 1 Village. What: 5K and 10K road running race. Where: Marvin Ridge High School; Parking available in the student lot. When: January 31st. 10K starts at 7:30 am, 5K at 7:45 am. Why: Because waffles! And because some 25 million Americans have some form of Alpha-1 antitrypsin deficiency. Funds generated by this event will help support Alpha-1 Village, a non-profit which works to raise awareness and provide support to the sufferers of this severely underdiagnosed genetic disorder of the liver. Long before the first chicken wing is dunked in a pool of blue cheese, competitors young and old(er) will run it out around the streets of uptown Charlotte on the morning of the big Superbowl game. What: Football themed 4-mile road race and 100 yard kid’s dash. Race officials will be decked out as referees, mileage markers as down markers, and the finish like an end zone. Where: Start/finish line is near the North Gate of Bank of America Stadium, corner of Mint and Stonewall streets. The race course travels the streets along the western edge of uptown. When: Sunday, February 1st. Four mile race starts at 9 am, 100 yard kid’s dash at 10 am. Why: Lots of opportunities for awards—awards for top three finishers in any of the 32 different divisions separated by age and gender. Plenty of swag: mini-footballs for kids, performance long sleeve T-shirts, Pint glass for adult 4-milers. Costume contest for those best dressed in their favorite NFL team’s garb. Custom NFL team color bibs. Music and beer follow the race. Kids living with neurofibromatosis (NF), a debilitating genetic disorder which causes tumors to grow throughout the nervous system, are forced to face the world with a type of courage most will never know. The Cupid Undie run asks participants to face a little fear of their own while raising funds to defeat NF. Where: Pre and post party at Rooftop 210. Run course loops around the Epicenter on College, 3rd, Tryon, and 5th streets. When: February 14th. Party starts at noon with awards for the most successful fundraisers at 1 pm. The Undie Run starts at 2 pm with a post party directly after. Why: To help crush NF. To bravely show your support for The Children’s Tumor Foundation. And to watch hundreds of other brave runners bare their, um, soul for a good cause. Sometimes you just want to have a jog, cram an obnoxious number of breakfast pastries into your mouth hole, then go for another jog. Finally, an organized event with you in mind. What: A 4 mile total road run with a snack stop along the way. Run two miles out, polish off a dozen Krispy Kremes, then run (or whatever you do after going Fear Factor on a dozen doughnuts) 2 miles back to the start. Where: Race begins on the campus of Winthrop University, Rock Hill, NC. The turn is at Rock Hill Fountain Park. When: February 28th (two merciful weeks after the Undie Run). Four miler starts at 8 am. Why: Calorie positive workouts are how champions are made! 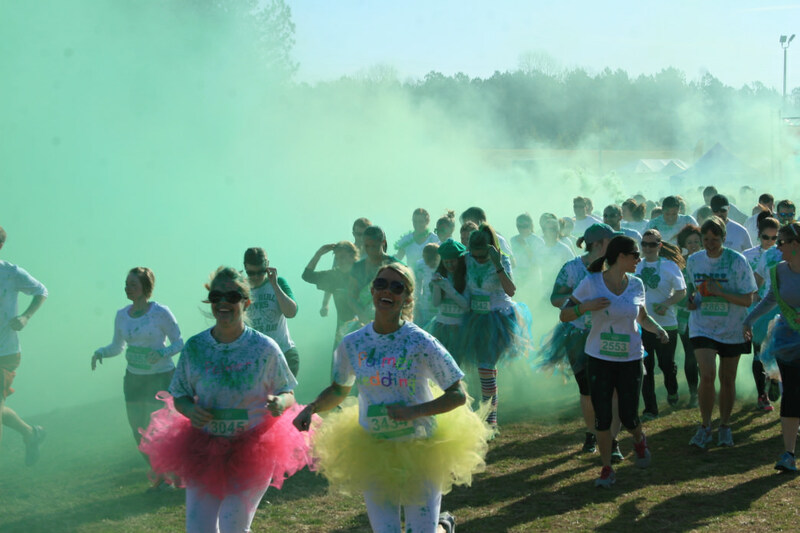 Every March the folks at the USNWC put on a hue-ge celebration for all things green. The man-made river is given a new tint for the day and helpful race officials throw biodegradable (see, green) color bombs at runners during the annual 5K trail race. What: 5K untimed, color trail race. Awards for top five men and women finishers and for cleanest and greenest runners. Where: Race takes runners on the well-groomed, single-track trails of the U.S. National Whitewater Center. When: Saturday, March 14th. Race begins at 10 am. Why: The trails at the USNWC are fun to run any day. The festive atmosphere and added challenge of dodging color bombs makes for a great way to kill a few extra calories. Plus, stick around after the race for the Green River Revival and enjoy a range of beers that rivals the live music line up at the festival. Many Charlotte area runners are discovering the challenging trails at George Poston Park . The Race for Rare takes full advantage of the twists, turns, ups, and downs that are the status quo of the trail system. What: 5k or 10 mile trail running race. Where: The singletrack trails at George Poston Park, Gastonia, NC. When: Saturday, March 22nd. Races begin at 8 am. Why: If George Poston Park isn’t on your running radar, this a great chance to learn the trails. And it’s for a great cause. Rare diseases don’t necessarily garner the fund raising attention as more well-known afflictions. Collectively, however, some 75 million people in the US are afflicted with a rare disease. Celebrate the first weekend of spring with a group ride through rolling hills with a few hundred of your closest area cyclists. What: 30, 50, and 70 mile support road bike ride. Event includes SAG vehicles for each route and rest stops with food and drink. Where: All rides begin at Harrisburg elementary school and travel through the rolling countryside of Cabarrus, Union and Stanly counties. When: Saturday, March 22nd. All routes start at 9 am. Why: Riding the rolling hills just east of Charlotte is a road cycling favorite any time of year. Having the support of a SAG vehicle, food and drink pit stops, and a couple hundred fellow riders makes the day all the better. Build confidence, encourage an active lifestyle, and have a great big pile of fun tackling teamwork oriented challenges at this TV show themed family event. What: Two person teams race around a 1 mile course solving puzzles and physical challenges. Multiple levels of competition challenge a range of participants. Challenges are inspired by the TV show The Amazing Race. Where: Pineville Lake Park, Pineville, NC. When: Saturday March 22nd. Teams leave in waves, beginning at 3 pm. Why: Having a day out with your kids, working as a team, and getting some exercise is a great way to spend a Saturday afternoon. Plus, the top 25 teams from each local race qualify for the championships and a chance at cash prizes. Get these on your calendar before you see your New Year’s resolve begin to dissolve.